The animated brushes come in 3 different sizes and 3 different intensities. This way, you can apply extraordinary effects when decorating your photos. You can apply fantastic texts created using the animated elements. Once you have completed your animated love frames, you can save them as live wallpapers and set them as your phone’s background, or save your project as an image. The application will add more colour and life to your photos! Watch our demo video to see what you can do with the love photo frames app. 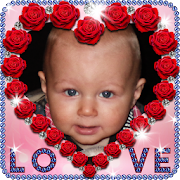 Application: love photo frames is ideal for lovers who want to decorate their photos. Using love photo frame also you can express your love for the other person. In case of any problems with the effect of Animated love frames, instead of giving us the negative opinion, please send us an e-mail and review briefly the problem. It will help us to solve it in the next updates of app. Love photo frames app is free but contains ads inside app and in settings of the wallpaper. Revenue from advertising will help us to create new attractive wallpapers and applications. All permissions are required only for advertising and are supported by trusted vendors.